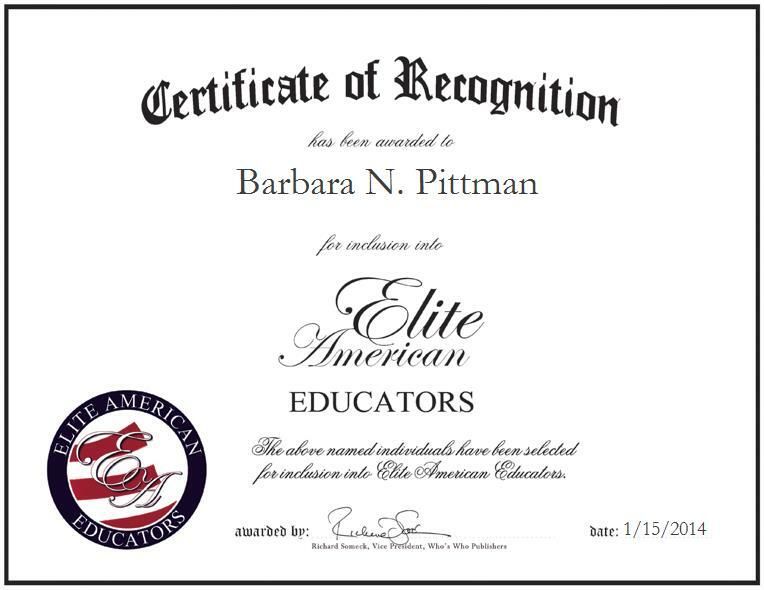 MILWAUKEE, WI, January 15, 2014, Barbara Pittman, retired teacher at Milwaukee Public Schools, has been recognized by Elite American Educators for dedication, achievements and leadership in education.Ms. Pittman worked in the education field for 33 years and spent 24 of those years working in Milwaukee Public Schools. An expert in special education, Ms. Pittman was responsible for teaching, assisting students, performing administrative duties, acting as a liaison between the school and parents, and consulting with parents about their children’s progress. She attributes all the success she has experienced in her career to her dedication, interest and hard work.Ms. Pittman’s began her career working as an adult business education teacher. She realized she enjoyed the work and went back to school to get the credentials she needed to become an elementary education teacher. Ms. Pittman holds a master’s degree in adult education from the University of Wisconsin-Milwaukee, and a bachelor’s degree in business education from the University of Wisconsin-Whitewater. She is also holds certifications in special education, administrative leadership, alternative education, and business education.